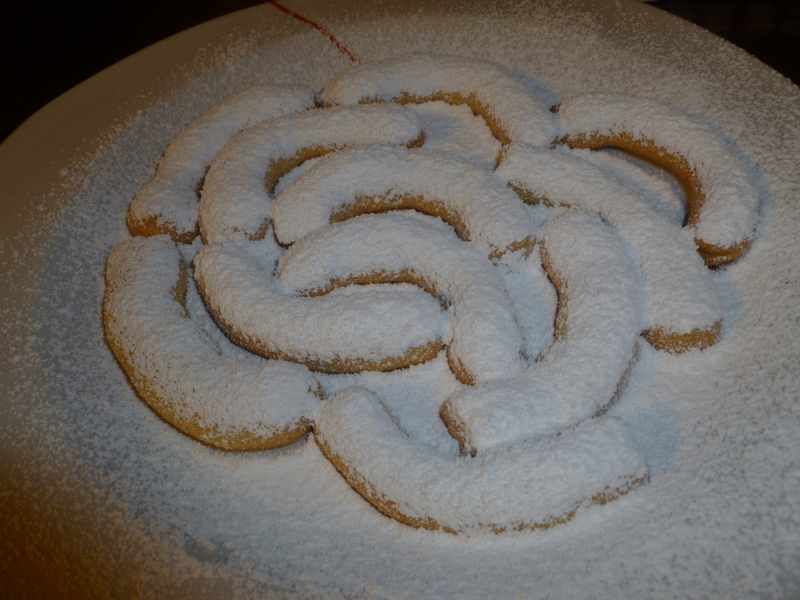 Just when I was thinking what recipe to post on my blog I saw two cookies left in the kitchen waiting for me. 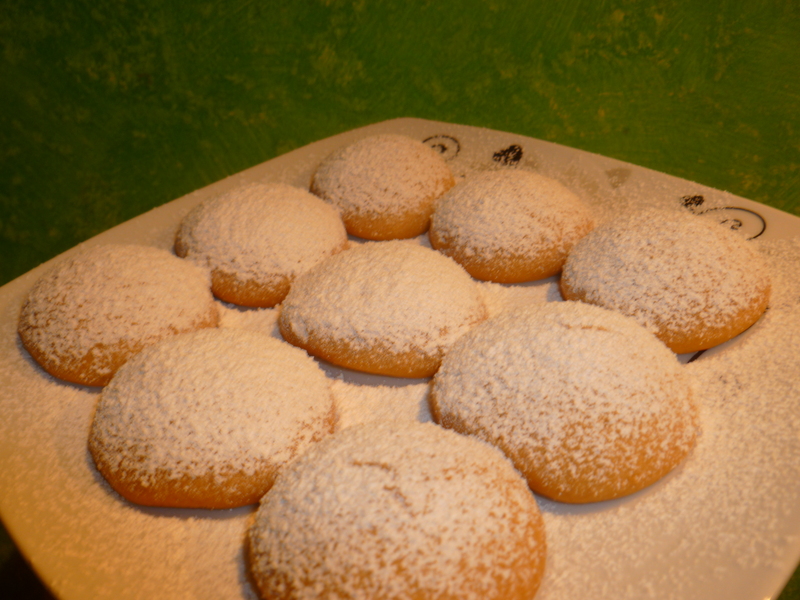 I found out they were called: Kourabiedes (pronounced kou-ra-bee-ye-des) or in other words: Greek butter cookies. After tasting these delicious cookies, I immediately ran into the kitchen to make them myself. I had no recipe of it so a little research on the internet was required. These cookies usually made with brandy, ouzo or cognac weren’t the ones I was looking for so I decided to go for my own version leaving out the shot of alcohol. 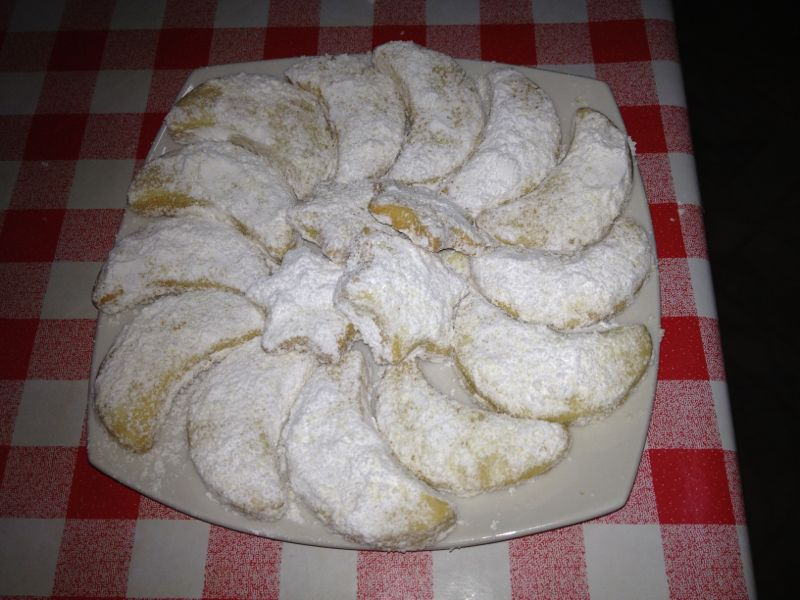 Kourabiedes – a little confusing for Turkish people – are made during Christmas with brandy, ouzo or cognac. Confusing because the Turkish word ‘kurabiye’ means cookie and therefore, can be any type of cookie when an adjective precedes the word kurabiye, for instance, ‘çikolatali kurabiye ‘means chocolate cookie while kourabiedes only means ‘butter cookies’ in Greek. Confusing isn’t it? 🙂 I remembered making similar ones before like the Turkish ‘un kurabiyesi’ which is frankly the same as kourabiedes when you leave out the alcohol. Similar to the Greeks we make lots of these during ramadan or other festivities. So I wondered how different these kourabiedes could be of the un kurabiyesi I had known for whole my life? Both the Greek word kourabies (singular) as the Turkish word ‘kurabiye’ is derived from the Arabic word ‘urabiyya’ which in turn originated from the Dutch word ‘koekje’ (koekie). Boring I know… In any case, whether the Greek version or the Turkish, these cookies are delicious and are by far my favourites. And the best part? They last for weeks and actually get better the day after so no rush to eat them all at once. In a bowl whip the butter using a mixer (or easier use melted butter). Add powdered sugar. Mix. Add the egg yolk and vanilla. Mix well. Sift flour and baking powder. Mix or knead well until dough is smooth or until non-sticky (if the mixture is still sticky add more flour). Take walnut-sized pieces of the dough and shape into balls (and slightly flatten them) or crescents. Place the kourabiedes on a tray (covered with baking sheet) and bake in a preheated oven at 175 degrees until slightly brown. 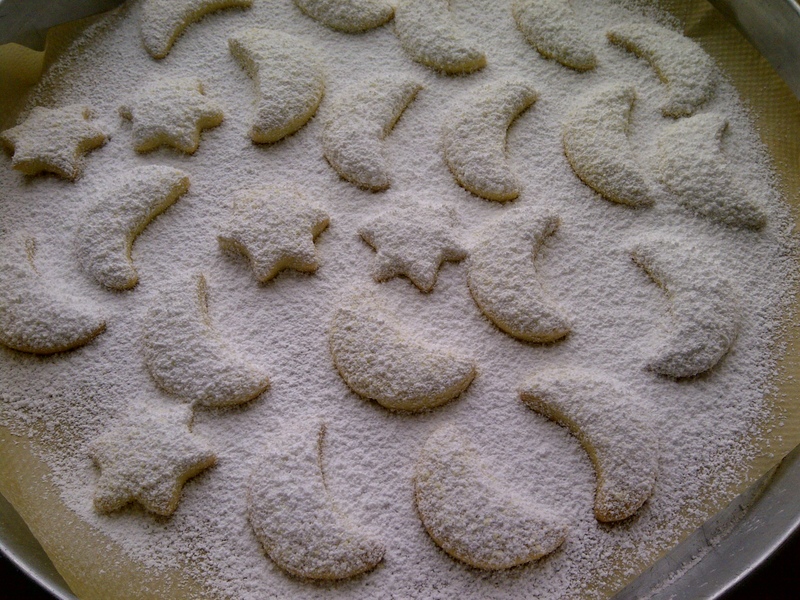 Sift powdered sugar over the cookies when taking them out of the oven and sprinkle more before serving. This entry was posted in Pastries and tagged Cookie, Greek, Kourabiedes, Turkish.